1950s | No Chic. Just Geek. I am given to understand that there were some grumbles that the TV schedule for the festive season just past was in some way sub-standard, with rather fewer ‘treats’ than people have become used to. It may not come as a surprise if I reveal that I am not the kind of person to be particularly stimulated by Christmas specials of Call the Midwife, Strictly Come Dancing or (God help us) Michael MacIntyre’s Big Show, and lavish all-star Christie adaptations don’t really do it for me either. However, on reflection, I must admit to a little surprise and mild disappointment, for at one point all the signs were that one of the BBC’s Christmas offerings was going to be a new adaptation of The War of the Worlds. Now, when I think about it, I’m actually quietly certain that this thing is going to be a disappointment to me whenever it actually appears, because the BBC, which is usually pretty faithful when it comes to bringing Jane Austen or Anthony Trollope to the screen, has historically shown no such fidelity when it comes to classic genre fiction – see, for instance, the atrocious version of The Day of the Triffids they inflicted on the world at Christmas 2009. But such is my fondness for The War of the Worlds that I will stay optimistic until it actually arrives. I should make this clear – The War of the Worlds, the novel? Love it. The radio version? Love it. The concept album? Love it. Stephen Baxter’s authorised sequel? Love it. The Spielberg movie? I can appreciate its merits. The 1980s TV show – well, now, let’s be sensible. I watched pretty much the whole first season, which many would say was going above and beyond the call of duty. One of the (many) problems with the War of the Worlds TV show is that it’s operating two steps removed from H.G. Wells, in that it is basically a small-screen sequel to the 1953 movie produced by George Pal and directed by Byron Haskin. You will not be terribly surprised to learn that I really like this movie, too, even though it has an extremely liberal attitude towards the source novel. After a slightly frantic set of credits, the film gets underway, as any self-respecting iteration of The War of the Worlds must, with the famous ‘No-one would have believed…’ passage from the book, updated to reflect the film’s 1950s setting. 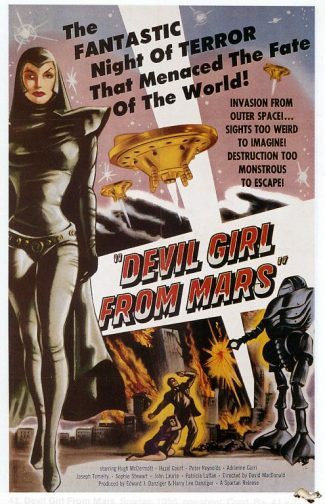 Through the wonders of gorgeous special effects and rather dubious astronomical exposition, we learn that the planet Mars is dying, and its inhabitants have only one option when it comes to migrating to another planet – it’s Earth or bust! Everyone on Earth is oblivious to this, of course, even after what seems to be a rather unusual meteorite lands in the California hills. The locals are delighted, thinking that their ship has come in and a new tourist attraction has arrived, but rugged scientist Clayton Forrester (Gene Barry) is less convinced – the new arrival seems to be radioactive, and didn’t behave like a normal meteorite. He goes off to the local square dance with impressively-banged local girl Sylvia (Ann Robinson – not that one) to pass the time while the rock cools down. My general feeling about both The War of the Worlds and The Time Machine are that they are foundation stones of science fiction, but also books which are now sort of dated: both of them are driven by social and philosophical concerns and are indeed essentially topical satire – of the British class system, in the case of The Time Machine, and the British empire with The War of the Worlds. Unsurprisingly, the satirical and allegorical element of the novel does not survive into the film, which is instead almost as pure a piece of Red Scare thrill-mongering as you can find. It is telling that, for all the indications that this is a global catastrophe (we are shown the Eiffel Tower toppling, and Martian war machines in front of a ruined Taj Mahal), there is not one mention of the Martians attacking the Soviet Union, or indeed that the USSR even exists. Wells’ concerns have been extracted and replaced by those of 1950s Hollywood. I could easily fill the rest of this piece by cataloguing all the other numerous and comprehensive differences between the original novel and this adaptation: most obviously, there is the shift in setting, from southern England in the early 20th century to California in the 1950s, and there’s also the fact that the Martians in this movie cruise around in sleek manta-ray hovercraft, rather than the iconic tripedal fighting machines of the book. It’s really the case that virtually none of the specifics of the novel’s plot survive into the film, which concerns itself almost exclusively with the first half of the book. This concerns the initial Martian landings, their crushing of the forces sent against them, and the panic and chaos that convulses human society. Other than the conclusion, the second half of the novel – which deals with the Martian occupation of England, and goes into slightly more detail about their nature and technology – is entirely absent. 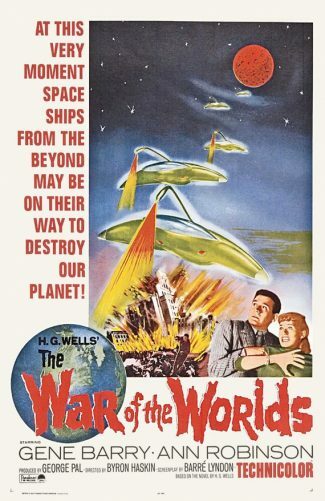 This is no doubt partly due to the technical limitations of the period – it’s hard to imagine how the special effects of the 1950s could have rendered the spread of the red weed, for instance – but Wells’ more philosophical musings are not really the stuff of an American sci-fi movie, while in another key respect the film is entirely at odds with Wells’ conception. Whether you consider the end of The War of the Worlds to be an outrageous deus ex machina or a subtly-foreshadowed denouement entirely of a piece with the rest of the book is probably a matter of personal taste, but it survives in the movie more-or-less intact. However, Wells intent has been comprehensively subverted, in another fundamental change. Wells’ atheism is discarded, and – like many classic SF movies from this period – the themes of the film are presented in almost spiritual terms. People take refuge in churches; there are many references to prayer and miracles; when one boffin gravely announces the Martians will conquer the world in six days, Ann Robinson reminds us all that this was the same length of time it took to create it. In short, the film is basically reminding the audience that technological superiority is all very well, but victory only comes by the grace of God – the death of the Martians here isn’t simply a matter of biological process, but presented as divine intervention. The end of the film, with church bells tolling and a grateful population flocking to give thanks, appears to have been an influence on at least two other films – the film version of Day of the Triffids, and the British catastrophe movie The Day the Earth Caught Fire. It seems, therefore, that very little of the actual substance of the novel survives into this adaptation. Why, then, am I so fond of it? Well, quite apart from the fact it often has a kind of hokey charm unique to itself, it’s also the case that while the film changes virtually every detail of the book, it captures its tone and spirit with an accuracy which is hugely impressive. The Martian onslaught against the US army, death rays slashing in all directions as the human guns fail to hit their targets, is absolutely of a piece with the novel; the eerie scenes with Forrester and Sylvia trapped in a ruined house, Martians all around them, are also closely inspired by the similar section in the book. The climactic sequence depicting the breakdown of law and order and near-rioting in the streets as the Martians advance on downtown Los Angeles also catch the essence of Wells’ description of ‘the rout of civilisation… the massacre of mankind’ extraordinarily well, in the circumstances. In the end I’m almost moved to describe the movie of The War of the Worlds not so much as an adaptation as a cover version – it retains only the most basic outline of Wells’ book, changing virtually every detail of narrative and theme. And yet it also seems to have locked onto the most vivid and powerful segments of the story and retained them, in terms of their emotional impact and effectiveness. It’s a fairly irregular way to go about adapting a book, but the result is a movie that still somehow does credit to the source material. Not many adaptations of classic SF novels stand up as well as this one. I used to be a fairly regular participant in the great British tradition of the pub quiz, back before the institution was effectively killed off by the rise of the smartphone and hand-held search engines. One of the methods by which the proprietors of these events tried to limit people’s ability to cheat was by introducing things like music and picture rounds, where you couldn’t just google for the answers. There was usually an interesting mixture of difficulties on display. I recall on one occasion being heads-down with the rest of the team poring over some of the more challenging pictures we were being asked to identify: 1970s football managers, obscure cousins to the queen, and so on. And there was one photo of a middle-aged man in a shapeless hat and a raincoat, smoking a pipe, with a rather peculiar expression on his face. ‘Is that Eric Morecambe without his glasses?’ wondered one of the team, aloud. ‘No it’s not. Maybe it’s Harold Wilson,’ said another, prompting an instinctive and visceral hiss from the members of the team who also belonged to the local Conservative Club (one can’t always freely pick one’s pub quiz team-mates). Something was stirring in the back of my brain, as the machinery back there (which I have given up trying to understand) quivered and buzzed and finally coughed up an answer. ‘I… I think that’s Jacques Tati,’ I said. They stared at me a lot, torn between lack of comprehension at what I was on about and bemusement that I actually appeared to know the answer. For myself, I was astonished that a picture of a French comedian from the middle of the last century had turned up in a pub quiz picture round in the north-west of England, and also that I was able to recognise him despite never actually having seen one of his films. I mean, come on, it’s French comedy: our cousins across the channel are famous for their wine, their cuisine, their sense of style, and the sense of humility which they take with them whenever they travel abroad, but French comedy is (generally speaking) down the list beneath their pop music when it comes to les grandes realisations de la France. Then again, there are exceptions to everything, and if there is a French comedian with a claim to international recognition it is Jacques Tati, acclaimed as one of the greatest auteurs and film directors of all time by people who should actually know about that sort of thing. Well, as I say, I’d heard of Tati (and clearly seen a picture of him at some point), but had never seen one of his movies until recently when a stack of films passed on to me by a friend happened to include Tati’s 1958 film Mon Oncle (even I, who didn’t even take GCSE French, can figure out that this means My Uncle). With a title like that it sounds like some sort of sentimental, family-themed romp, but (and to be honest you had best get used to this) Mon Oncle defies – or, perhaps, ignores – expectations. Tati plays his most famous creation, Monsieur Hulot, a carefree, easy-going gentleman of middle years, residing in a chaotic Parisian neighbourhood at the top of a ramshackle apartment block. This is quite at odds with the lifestyle of his sister (Adrienne Servantie), who along with her husband Arpel (Jean-Pierre Zola) has relocated to an ultra-modern home in the suburbs, with all kinds of modern fixtures and conveniences. Despite all of this, their son (Alain Becourt) seems much happier spending time with his uncle, Hulot. This is a source of much chagrin to the Arpels, who view Hulot as a feckless embarrassment and seemingly spend most of their time trying to get him to adopt a more ‘appropriate’ lifestyle – working in Arpel’s factory, and so on. There is, it must be said, not much more in the way of plot when it comes to Mon Oncle, mainly just a succession of set-pieces which usually depict Monsieur Hulot unintentionally wreaking havoc upon the ordered existence and plans of the Arpels. Your sympathies are intended to be with Hulot throughout, not because he is a particularly engaging or identifiable figure, but because the lifestyle of the Arpels is depicted as phoney and dehumanised: their home is a sterile environment depicted in a palette of dull greys, the most distinctive feature a fairly ugly fountain (which Mme Arpel hurries to switch on whenever they receive an important guest). This extends to the film’s view of the factory and the consumerist lifestyle which the Arpels have enthusiastically adopted: rows of grey cars trundling in perfect unison between grey boxes. The contrast with the slightly shambolic, but always warm and vibrant neighbourhood in which Hulot resides could not be much more clear. Points are obviously being made, and there’s a certain sense in which Mon Oncle would be a good double-bill companion piece to George Romero’s Dawn of the Dead, for they are both obviously very seriously-intentioned satires of consumerism – indeed, Mon Oncle occasionally seems almost reactionary in its suspicion of modern technology. Satire isn’t an exact synonym for comedy, of course, which I suppose is my way of delicately raising the issue of whether this famous comedy film is actually funny or not. I suppose it is, but this feels like the kind of comedy which is meant to be taken very seriously – in other words, it is Art. As you admire the conception, composition, art direction and performances of each scene, it almost seems disrespectful to laugh at the film: an approving, serious nod feels like a much more appropriate response. It’s not really the style of comedy you expect, either. Monsieur Hulot is clearly part of a tradition of clowning which – in cinematic terms at least – goes back at least to Chaplin’s Tramp and continues on to characters like Mr Bean (Rowan Atkinson has acknowledged Tati’s influence on his work). But the difference is that with the Tramp or Bean, you are always watching a star vehicle – they are always centre stage, the comedy built around them. In Mon Oncle, on the other hand, many of the scenes are filmed in long shot, with Hulot just one figure in a crowd of other characters (if he is present at all). He is a major character, but the film does not revolve solely around him. I should probably also observe that there is an abrasive element to Anglophone clowning which seems to be almost entirely absent here. There is a lot less falling-over, slapstick, and comic violence than you might expect – there’s a fairly lengthy sequence about an automatic garage door opening mechanism which eventually causes the Arpels a lot of trouble after their dachshund starts to accidentally trigger the mechanism. I was anticipating the moment where someone either gets hit by the door or entangled in the works and whisked out of sight; it never happens and it almost feels like a scene without a pay-off. There are many other almost-throwaway moments of visual inspiration. So I have to conclude that while Mon Oncle is clearly a well-made film and the product of a distinct creative sensibility, it didn’t actually make me laugh very much. Then again, it seems to be a film about ideas and the changes in French society in the late 1950s at least as much as it is a comedy; the conclusion (Hulot is banished to the provinces to become a sales rep) seemed to me to be genuinely affecting and rather sad. Still, an interesting film, though definitely the product of a rather different comedic tradition. As this long, hellish, The Day the Earth Caught Fire-esque summer has worn on, so the Kubrick season at the Phoenix has come to a conclusion, which is obviously cause for sadness. But looking on the bright side, in its place we are currently enjoying a season of Hitchcock revivals, which is always something to relish. Most recently on the screen was a movie from the start of the 1950s, the decade which arguably saw Hitchcock at the height of his powers and brought him his most sustained run of popular and critical successes. The film in question is Strangers on a Train, one of the great director’s most playfully ambiguous works. Is it a psychological thriller? A film noir? A pitch-black comedy? Or just a searing indictment of poor health and safety standards at American funfairs? Nearly seventy years on, the jury is still out. Farley Granger plays Guy Haines, an amateur tennis player and aspiring politician, who is making a fairly routine train journey when – apparently by chance – he makes the acquaintance of Bruno Anthony (Robert Walker), a wealthy, charming fellow who seems to be a fan of his. Somewhat reluctantly, Guy gets to know Bruno better, and it transpires that both men have their problems: Guy is stuck in a marriage to an unfaithful wife (Laura Elliott), while Bruno finds himself oppressed by his authoritarian father. Bruno takes the opportunity to unveil his ‘perfect murder’ scheme, whereby he will kill Guy’s wife, while Guy disposes of Bruno’s father – as each man apparently lacks a motive for these particular killings, they should get away with it, with no difficulty. 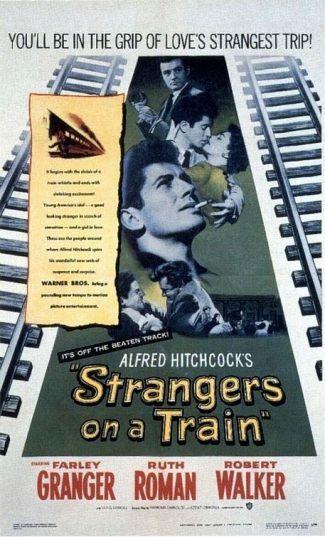 Strangers on a Train is not quite at the very top of the list of Hitchcock movies everyone can name – it’s a step or two down from Psycho, Rear Window, North by Northwest and Vertigo, for instance – but it is still immediately recognisable as a product of the same creative sensibility. From the very first seconds you are aware of the playful way in which the director is presenting the two leads as doubles, or opposites – their arrival at the station opens the film, with Hitchcock choosing to show us their feet rather than their faces, saving this for the moment when they first see each other. There is also the same kind of moral ambiguity that shoots through so many later Hitchcock films – it’s made clear that Guy really does want to murder his wife, it’s only the social contract which is keeping this urge in check. There’s a sense in which Guy is a bad, er, guy. In the same way, there’s a sense in which Bruno is, if not a good guy, then at least a charming, appealing presence whenever he appears. This is mostly due to a terrific performance from Robert Walker, whose final completed film this was: Walker pretty much walks away with the acting honours from Strangers on a Train, as the good guys are decent but wooden, and his only real competition (Elliott) is only in the film briefly. Elliott manages to be so objectionable that the set piece in which Walker stalks her through a funfair before eventually strangling her – the murder famously reflected in her fallen glasses – is essentially one in which the audience is complicit with the killer, or at least feeling no guilt at anticipating the murder. Of course, there’s something else going on in this film, a subtext which is surprisingly clear given the time it was made. Guy is dashing but weak, led into immorality by a charming older man with a mother-fixation. The coding is quite obvious – Bruno is presented as a thinly-veiled predatory homosexual, aiming to seduce Guy – morally, if not physically. Robert Walker’s performance is very good, but it’s also kind of Liberace meets the Boston Strangler. Suffice to say that the love of a good woman (Ruth Roman) is essential to Guy’s clearing his name and resolving the crisis. As the film goes on, it progressively deviates, if you’ll pardon the expression, from Patricia Highsmith’s original novel, which (to minimise spoilers) concludes with Guy being arrested, and this may be why the initially watertight plotting of the film begins to unravel somewhat. There’s something a little melodramatic, or at least rather improbable, about the way the climax is managed – Guy has to win his tennis match in double time, lose his police tail and then get to the scene of the crime before Bruno can plant the evidence that will see him arrested. You could poke half a dozen holes in the scenario, yet it is still thoroughly engaging, enjoyable stuff, and you do get the sense Hitchcock is having fun, not intending the audience to take it too seriously either . There are quite a few moments during the climax of the film which drew general laughter from the audience at my screening, and I’m sure some of this was intended. But all of it? I’m really not sure; Hitchcock remains as slippery a magician as ever. Possibly if this film were in colour, or had a more distinguished cast, it would perhaps have a slightly higher profile. Nevertheless, it is still a supremely accomplished movie – the plot holds together well enough, there is plenty of snappy dialogue to enjoy (‘I may be old-fashioned, but I thought murder was against the law’, ‘When an alibi is full of bourbon, it can’t stand up’, and so on), and the story has just enough darkness and ambiguity to it to deliver a pleasant frisson, rather than becoming too bleak or downbeat. A very fine film, and still only one of Hitchcock’s relatively minor works. It seems that, in the UK at least, Swedish culture is enjoying a moment in the sun right now: not only is a new series of the brilliant thriller The Bridge imminent, but there was also the recent news that melancholic power-pop royalty Abba have been back in the studio after 35 years, which may or may not have something to do with the imminent release of the sequel to Mamma Mia!. (Although I have to say that none of my Swedish friends actually seem to like Abba. This may be why they don’t actually live in Sweden any more, now I think on it.) Adding to this general sense of festen is a series of films celebrating the career of one of Sweden’s most renowned directors, Ingmar Bergman. Most of these have been on at funny times or have clashed with meetings of my Dungeons and Dragons group (oh yes, I live the life), but I was able to make a showing of Bergman’s celebrated 1957 film Smultronstället, better known by its English title Wild Strawberries, and apparently known specifically to the ticketeer at Oxford’s Ultimate Picture Palace as Old Dude on a Road Trip – one wonders how he refers to The Seventh Seal (ticketeer in question also welcomed me into the cinema with a hearty cry of ‘It’s Bergman time!!!’). 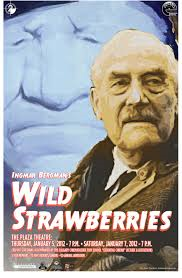 Well, quibble one might, but Old Dude on a Road Trip is a fairly accurate description of Wild Strawberries, from a certain point of view at least. The story concerns Professor Isak Borg (Victor Sjöström), an elderly doctor about to celebrate fifty years in the profession. A ceremony in his honour has been laid on at his alma mater in Lund, and all the plans for his trip down from Stockholm have been made. However, as the ceremony draws close, Borg finds himself beset by unsettling dreams and decides to do something a bit different. Much to the displeasure of his housekeeper, he decides to drive down to Lund. Along for the ride is his daughter-in-law Marianne (Ingrid Thulin, whom I suspect is everyone’s idea of what a Swedish movie star looks like). Well, I hope it doesn’t constitute a spoiler if I say that by the end of the film Professor Borg has come to a new and deeper understanding of himself and the course of his life, although quite how this has come to pass remains slightly obscure. The whole story is executed with an almost absurd lightness of touch, completely devoid of the big, histrionic Moments of Character Transformation you will likely find in an Anglophone treatment of a story of this kind. The initial dream sequence sums this up: nothing overtly unusual or disturbing occurs at first, but there is a tiny incremental accumulation of sound and image until suddenly you find yourself deeply unsettled by what is on the screen. Nothing much seems to be happening: but you do get the sense that Bergman is working the script and the screen for all they are worth in every moment of the film. This may explain why Sjöström, who at first glance spends much of the film wandering about looking distracted, apparently found it such a gruelling experience that he was on occasion to be found beating his head against the wall between takes. Certainly the actor gives a brilliant, terrifically understated performance as the initially stubborn and misanthropic old man; you never notice him acting. He is also notably well-supported by Thulin, Bibi Andersson, and Gunnar Sjöberg. Andersson and Sjöberg both play dual roles as the film progresses – one in the ‘reality’ of the story and the other in the fantasies which come increasingly to preoccupy Borg. There’s some symbolism going on here with the doubling: Andersson is playing Borg’s first love, who eventually forsakes him for his brother, and also a young hitch-hiker of whom he becomes perhaps just a bit too fond (both characters have the same name). Sjöberg, on the other hand, plays darker, more downbeat figures, symbols not of love but of cynicism and failure. It is he who presides over another disquieting dream sequence in which Borg must endure a nightmarish, unfair examination: watching the ominous mood Bergman evokes here you are definitely reminded that this is the man who eventually inspired Wes Craven to make Last House on the Left. But what does it all mean? Life, death, age, youth, guilt, sin, acceptance, denial, they are all in the mix which Bergman so deftly whips up. There is a touch of existential misery as the film goes on, but also perhaps some self-aware humour as well: at one point a debate over the existence or otherwise of God is resolved by a fistfight in a pub car park. One of the most obvious of Bergman’s disciples in English-language cinema is Woody Allen, and being rather more familiar with Allen’s canon than Bergman’s there are many weird pre-echoes here, in the bold internalism of this film, in the wise old man’s fascination with a much younger woman, in the sense that while nothing much seems to be happening, in fact everything is happening. In the end, though, while you could never call this film a comedy, it resolves itself with an enormous sense of compassion and warmth towards its characters – Borg is perhaps not quite redeemed, but certainly he finds a sense of contentment he is initially lacking. In this sense the film is indeed about a road trip, but it’s trip from a state of simple existence to one of genuine living, and one depicted with undeniable artistry and skill. What makes things happen? Every cause has its own cause, and sometimes events have many sources. So to talk about the origins of anything is arguable a slightly dubious proposition. But for some reason it seems particularly questionable when talking about the original Godzilla (J-title: Gojira), the 1954 movie, directed by Ishiro Honda, which unleashed the great beast on an unsuspecting world. On the face of it, this is a monster movie in the classic style, albeit an unusually bleak and intense one. The story opens with a string of unexplained shipping losses in the Pacific, shortly after some H-bomb tests in the region. Fish stocks in the region also seem to have been devastated, causing some consternation to the villagers of Odo Island: one of the elders suggests that Godzilla, a legendary sea monster, is responsible. Then a powerful storm strikes the island one night, and something comes out of the sea and wreaks terrible havoc in the village, crushing buildings and their inhabitants. The plotting of the bits with the human characters is always one of the special pleasures of the Godzilla series, and as you can see that was there right from the start: not only is there a melodramatic, soap operatic quality to all of this, but it’s also the most outrageous coincidence that nearly all the key human characters in the story should have this kind of pre-existing relationship. I suppose the film-makers would try to justify it by saying that a film as dark and fantastical as this one needs some kind of readily-accessible human story for audiences to connect to. They would have a point, too, for the really memorable bits of Godzilla do not really concern the Yamanes and their friends, but Godzilla himself, particular the sequence in which the monster (initially referred to as ‘the Godzilla’, though this is quickly abandoned – the confusion may be due to the fact that there isn’t a definite article in Japanese) rises from Tokyo Bay and proceeds to lay waste to the city. Again, on paper this sounds like just another genre staple – the JSDF shoot at Godzilla a lot, which has absolutely no effect, and he goes on to tread on various buildings, set fire to others with his nuclear breath, and so on. 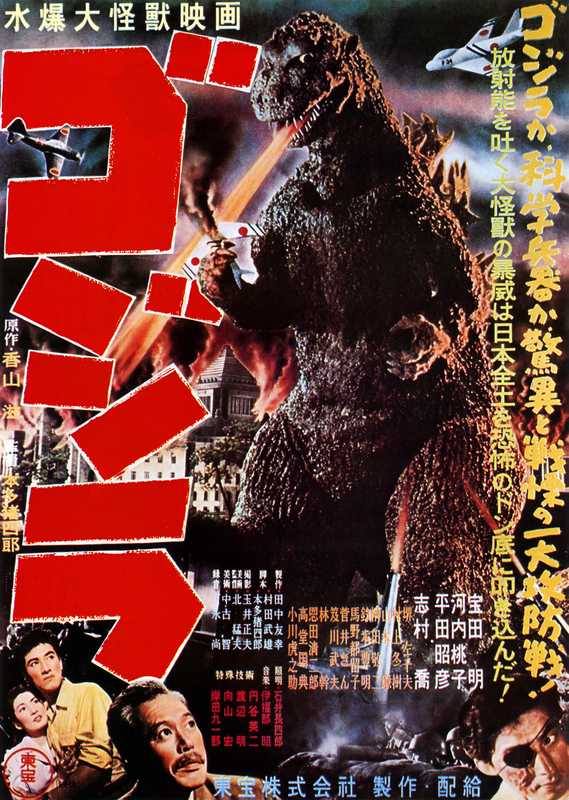 However, on this occasion the realisation is very different: in subsequent films it’s extremely unusual for anyone to actually be shown dying in the course of a monster rampage, but on this occasion the death toll seems astronomical – Godzilla toasts fleeing civilians in the street, rips down towers and sends the onlookers in them plummeting to their doom, and so on. At one point we see a young woman, in the midst of the destruction, clutching her young children to her and telling them that they will all soon be together in heaven with their father. The aftermath of the main Godzilla attack is depicted like that of a major natural disaster, which is rather in line with how Godzilla is presented – an elemental force of devastation, like a tsunami or a typhoon, only much worse. And here of course is where we come to the nub of the issue, namely what inspired Godzilla and what the film is really about. The film-makers themselves acknowledged The Beast from 20,000 Fathoms as an inspiration, a movie which was itself based on a Ray Bradbury short story, but that film doesn’t have remotely the same sense of utter trauma about it. The truth behind the central metaphor of Godzilla is of course well-known, and it isn’t as if the film itself isn’t dotted with clues: it opens with a terrible disaster befalling a Japanese fishing boat, but (tellingly) this isn’t a Godzilla attack, but being caught on the fringes of an H-bomb test – clearly an allusion to events befalling an actual vessel in 1954, the same year the film was made. Serizawa himself is a tormented, Oppenheimer-like figure, much given to musing on the responsibilities of scientists when it comes to their research being used as the basis of dreadful weapons. It’s not quite so much that Godzilla himself is a metaphor for the atom bomb, than that his attacks on Japan are in some way representative of what befell the country in the closing stages of the Second World War – Tokyo burned, thousands were displaced or died, and so on. It took the Japanese people a long time to come to terms with how the war ended, and there’s clearly some sort of catharsis going on here, with the fantastical nature of the film making it possible to address these issues in a way that would not be possible in a more naturalistic story. And, once again tellingly, the story of Godzilla is very much in line with the official version of Japanese history, as far as the war is concerned – Godzilla himself is roused not by the Japanese but the Americans (or so it is implied). Japan is an innocent victim of incomprehensible outside aggression. The original Godzilla is a dark and complex film, and in a way it’s quite surprising that so much of this hefty underpinning was abandoned so quickly in favour of knockabout monster battles. This first one isn’t nearly as much fun as many of the sequels, certainly, and it does have its own issues as a film – primarily, the climax is rather underwhelming and flat given how strong the earlier Godzilla rampage sequences were. But it does have a gravitas and power that the sequels just don’t, and it’s surely this that explains why people are still making films about Godzilla over sixty years later. Well, following a vague and unexpected stab at reviewing West Side Story last month, we may as well continue our meander through classic Hollywood musicals, in a new irregular feature entitled… you know, I really can’t think of a name for this strand. Gimme Some Jazz Hands? Once More With Feeling? Don’t Call Brosnan? Ladies and gentlemen of the NCJG readership, I throw it open to you. Anyway, on this occasion the all-singing, all-dancing extravaganza in question is Joseph L Mankiewicz’s Guys and Dolls from 1955. Like West Side Story, this is a New York tale of lives of sometimes questionable virtue and the redemptive power of love, but while only a handful of years separate the two films, they seem to come from totally different worlds. A jolly opening sequence reveals we are in a world of gamblers and petty crooks, but not one which feels remotely threatening or grounded. Our attention is first drawn to Nathan Detroit (Frank Sinatra), whose living is the organisation of illegal gambling. Nathan is a man with problems – his long-term (and, one suspects, long-suffering) girlfriend Adelaide (Vivian Blaine) is growing increasingly insistent that he marry her, but more importantly, he doesn’t have a venue for the peripatetic dice game he has been running for several decades: the only option available requires a $1000 payment he simply doesn’t possess. To get the cash, he has the bright idea of making a bet with high-rolling gambler Sky Masterson (Marlon Brando) that he will be unable to take strait-laced mission worker Sarah Brown (Jean Simmons) out to dinner. Will Sky win the bet? If so, will Nathan be able to hold his game? And will the guys end up happily ever after with their girls? No prizes for guessing the answers to any of the above. In the past I have praised the unique ability of the non-diegetic musical to combine the examination of serious social issues with the most uplifting, pure entertainment – but this is, of course, a best-case scenario, and Guys and Dolls is, I would suggest, not really a musical of the first rank. What does it speak of human nature? What is it fundamentally about? Well, er – sometimes you fall in love with someone you probably shouldn’t (rather more frequently than that, in my experience). Many men have commitment issues. And, er, that’s about it. Guys and Dolls doesn’t attempt to be remotely serious or realistic in any way. Everyone talks in the most bizarrely mannered way, with byzantinely convoluted sentence construction and no contractions, as if to hammer home the unreality of the film’s milieu. Perhaps this is because a realistic film about New York low-lives would be tonally inappropriate for the fluffiness of the plot, but it does result in the film feeling even more detached from reality. Based on a couple of Damon Runyon stories, its status as a New York movie is compromised by the fact the whole thing has obviously been shot on soundstages. This is a musical with all potential rough edges filed down: not just a soft centre, but a soft exterior as well. Even so, a musical setting out just to provide entertainment value isn’t necessarily a bad thing, but the real problem with Guys and Dolls is that this is a two-and-a-half-hour musical, at the end of which you will probably only be able to whistle the tunes of two or three of the songs. Not that most of the rest are actually bad in their music or lyrics (the composer is Frank Loesser, by the way), it’s just they will most likely have slipped quietly from your memory by the film’s conclusion, leaving you with only the title song (sung by Sinatra, Stubby Kaye and Johnny Silver), ‘Luck be a Lady’ (by Brando), and ‘Sit Down, You’re Rocking the Boat’ (Kaye again). This is a notably low hit rate for a major musical, and I found my heart starting to sink whenever Vivian Blaine launched into another of her solo numbers: again, these aren’t actively bad songs, but they’re mostly just plot-stopping filler. 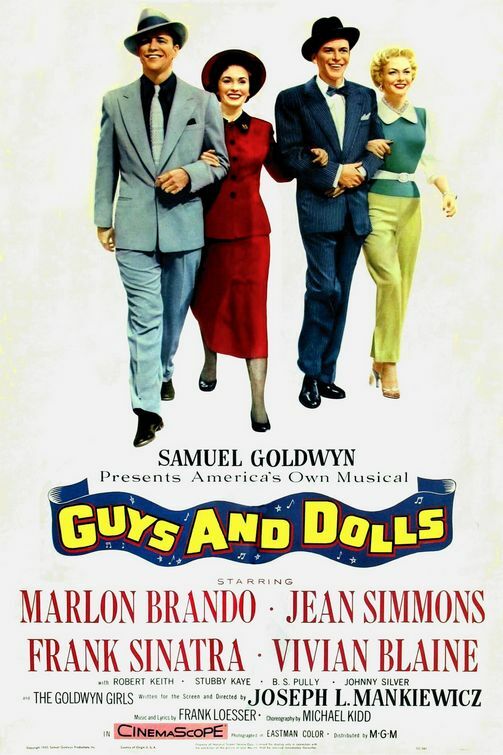 There are lots of other things, both good and bad, one could say about Guys and Dolls, concerning both the acting and the plot. You might expect Marlon Brando, the great exponent of the realistic performance, to be well outside his comfort zone in a musical as arch as this one, and it’s true that you get no sense that you’re watching One of the Greatest Actors of All Time from his performance. But he’s not bad; he passes the Brosnan Test comfortably, and even dances a bit without embarrassing himself. Jean Simmons is actually very good indeed as Sarah Brown, and their romance is genuinely touching in places, if a bit suspect in others (How to Handle a Woman the Sky Masterson Way consists of equal parts of moral blackmail and getting her smashed on Bacardi, apparently). On the other hand, the presentation of the Cuban characters in the movie borders on the racist (50s New York seems to be a whites-only city, too), and the climax seems to me to be badly mishandled: we don’t actually see the reconciliation of the two lovers, and the final double wedding is surely taking cheesiness too far. Like I say, you could say all these things: but it’s really just refrigerator noise, given that this is a musical where most of the songs are not really that great. Perhaps I’ve just been spoilt, having seen West Side Story so recently, but I do think that a genuinely first-rate musical should have a killer-to-filler song ratio of at least 70%-30%. In Guys and Dolls that ratio is backwards, and this may be why it’s not better remembered. As it is, this is good-natured, mildly-involving, gently amusing entertainment, but nothing much more substantial than that.